Qualified candidates often abandon job applications. Here’s how to reach them. Candidates who abandon applications are often still interested in the role — and four times as likely to respond. Now, they can share their profile before beginning an application, so you can reach them. Easily find these candidates by going to Manage Jobs. 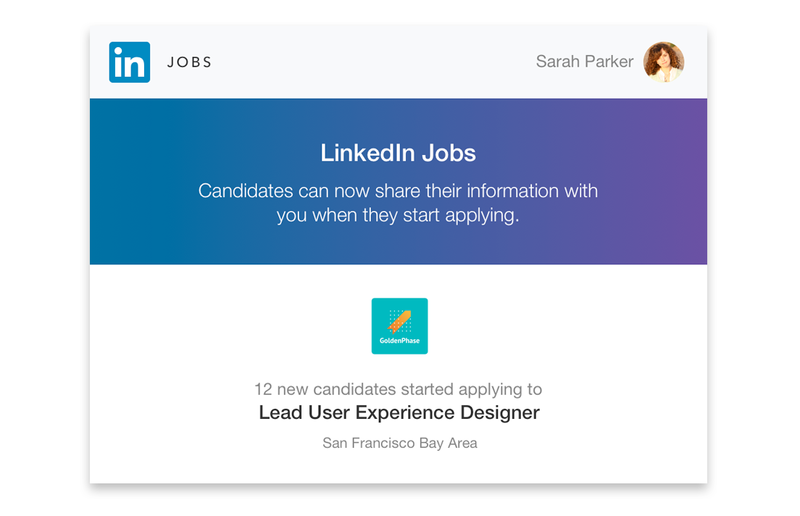 We’ll also send you a weekly email digest to update you when new candidates start applying. To build a strong pipeline, you can also review these candidates in the Past Applicants spotlight in Recruiter – including what types of jobs they’re interested in. What a great way to capture those who are ‘curious’. It’s a vital tool for a candidate and it lets a recruiter start a conversation. Apply Starters is currently rolling out to Recruiter seat holders, globally. Missed our Product Updates Webinar?